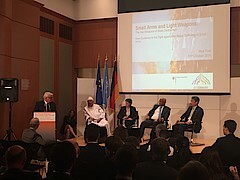 On 01 October 2015, German Foreign Minister Frank-Walter Steinmeier hosted a high-level panel discussion on the threat of Small Arms and Light Weapons proliferation on the margins of the United Nations General Assembly in New York City. During his keynote speech, the Guest of Honor, Nobel Peace Prize Laureate and former Costa Rican President Oscar Arias stressed that small arms and light weapons continue to claim the lives of more than half a million people every year. Despite the progress made with the passing of the United Nations Program of Action in 2001 and the Arms Trade Treaty of 2013, weapons continue to be traded indiscriminately across porous borders, ending up in the hands of criminals and terrorists. President Arias called for a moratorium of arms transfers to governments known to commit human rights abuses. During the panel discussion, the Malian Minister for National Reconciliation, Sidi Mohamed also stressed the difficulty of controlling weapons in areas with little government control. According to him, weapons come neighboring countries such as Libya, with assault rifles being sold for as little as 150 US$ in some parts of Northern Mali. The easy availability of weapons across the Sahel region is one of the key reasons for the proliferation of terrorist groups in a number of states from Egypt to Nigeria, who are taking advantage of the vacuum created by weak and collapsing states. In recognition of this regional threat, German Foreign Minister Steinmeier announced a strategic partnership with the African Union to combat the proliferation of SALW in the Sahel, which will be launched during an upcoming stakeholders’ conference in Addis Ababa on 16 October 2016. He also stressed the linkages between the need to control arms flows and the Sustainable Development Goals which were adopted by the United Nations in September 2015. BICC has been supporting efforts to fight the proliferation of SALW and to improve the security of stockpiles of arms and ammunition on behalf of the German Foreign Office in the Sahel region since 2009. During the high-level meeting, BICC provided technical and logistical support and showed its exhibition on SALW control efforts in Darfur, as well as a short film (“A Call for Arms”) on the continued threat of arms proliferation. Follow the link to find the official press release of the Federal Foreign Office.